Seattle metal and glass master Stephen Hirt whose pieces can be found in museums, hospitals, churches and public parks was commissioned to create the courtyard gate and entry chandelier for Block 41. Yet Stephen feared as a kid in college that he would never be able to achieve his dream of being an artist because he did not think he could draw well enough. But encouraged by an insightful professor, Hirt continued in art. After a year traveling in Egypt and Turkey and working on an Israeli kibbutz, he returned to his alma mater Illinois State as a graduate teaching assistant and focused on glass blowing and metal lost wax casting. His new expertise in metal came in handy when after buying a one-way ticket to Asia, he ended up running a French-owned bronze foundry in Thailand. He taught the workers how to make wax molds instead of using manure and clay and revolutionized production. Soon the foundry had commissions from New York City’s Metropolitan Museum of Art and the Louvre Museum in Paris. Hirt next worked as an art restorer for the Cleveland Museum of Art while his wife earned her masters in nonprofit management at Ohio’s Case Western University. They then went Sarajevo where Hirt got a grant to do art therapy with Bosnians disabled by the war. He taught them how to do paper casting with recycled garbage and create greeting cards they were able to sell. Hirt recalls how meaningful it was for them to earn money instead of being completely dependent. The program was called Glasnadey - Voice of Hope. His wife is now the assistant director of the Jackson School of International Studies at the University of Washington and Hirt creates metal and glass art pieces in his studio for himself and for select clients. What were your main goals for the Block 41 project? Block 41 is designed to be an event space so everything in it needed to be done with intention and purpose. With the gate I wanted a design involving vegetation to soften the look of the metal. With the chandelier, my approach was to be biomorphic. I wanted it to be aesthetic and not just utilitarian. I had recently seen the Renoir painting The Luncheon of the Boating Party at the Phillips Collection in Washington DC. So I wanted to bring that feeling of dappled light into Block 41 through the chandelier. How did you become involved in the Block 41 project? The Block 41 team wanted an art wall with references to the natural materials of the building that also celebrated its creative reuse as a sophisticated event space. The fact that it was a gate was secondary. But it is 60 feet long and has to open and close smoothly. I had to determine what the wind shear factor was, how many footings the gate needed, how many posts. That all had to be factored into the artistic design. It was like art meets commerce meets physics. It needed to be an art piece but utilitarian at the same time. Because I also work with glass, they asked me about creating a modular chandelier for the entry space. It needed to be a six-foot tall art piece of hanging glass. I began playing with glass rods that light could travel down. 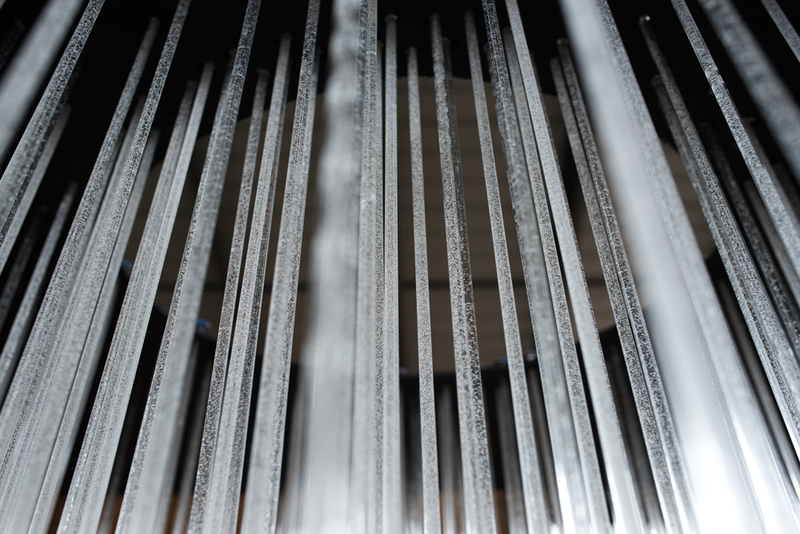 The glass rods convey an elegant simplicity that resonates with the building’s industrial heritage. Both the gate and the chandelier are unique kinetic elements and handcrafted sculptural pieces that embellish the space while also serving as functional objects. What have you enjoyed about working on Block 41? The Block 41 team was wonderful to work with. They and their architects Graham Baba gave me creative freedom with both pieces – and not everyone will give you that freedom as an artist. They were open to working together with me on how the pieces would evolve. The results reflect this with the chandelier and gate achieving a symmetry between being standing out as art pieces and blending in harmony with the building and site. What was a major consideration for you specific to the Block 41 site in creating the art installation gate and chandelier? The interesting thing about Block 41 is that because it is an event space and will always be changing to reflect the types and themes of the events, the pieces need to have a light touch while still being distinctive. Massive art pieces can sometimes look dehumanized and mechanical. I wanted both the gate and chandelier to make the gate and the chandelier to have an organic handmade quality. Why does Block 41 have a hand-crafted metal gate instead of a basic gate? Block 41 is a special building and merits a special gate. Both the building site and the streetscape are enlivened and enhanced by the presence of an art gate. How does the design of the gate as an art piece interplay with its use in an event venue? The gate will be facing a courtyard landscaped with plantings and light. I thought, what can we do to make sure that at night the gate doesn’t become a black hole? We can insert glass rivets into the metal and light them so at night they will look somewhat like a constellation. It will highlight the area and give it a unique interesting look while softening the urban edge. When someone is having a party out there at night, the gate at night add an elegant sparkle instead of being an opaque dark surface. How do you get inspired to create these kinds of pieces for a space? Many things in the world around become part of my mental library of samples. I can be reading a book or looking at a plant and see possibilities. Everything is poetry waiting to happen.